Fundraiser by Jason Sherry : Sending Jason to the DNC!!! Sending Jason to the DNC!!! I started working with the Bernie campaign in October of 2015 by helping to organizing meeting in Longmont, CO of Bernie supports. When the campaigned moved into CO in Dec I became the Data Captain for HD11 and took over the role as overall Captain due to unavailability of the initial one. As Data Captain I created focused VPBs and canvassing list to help get Bernie supporters out to caucus on March 1st. I also canvassed, made calls, organized events, and ran meetings. I was putting in over 40 hours a week leading up to March 1st and 100s of hours total organizing, canvassing, and make calls for Bernie! Since March 1st I created and Boulder County Delegates for Bernie Facebook group, mailing list, and group text service to contact the almost 600 Boulder County Delegates to have a few meetings before the County Convention on 3/19/16. I contacted over 1,000 delegates & alternates to share key information about the convention, help get answers to questions they had, and to help setup rides for people that needed them. On April 15th I was elected as a National Delegate for Bernie Sanders in the Congressional District 4 convention. I am now raising money to help pay for the VERY expensive trip to Philadelphia in July. Airfare is ~$500, but the hotel rooms are $600 a night!The Bernie campaign has booked a block of rooms and is STRONGLY suggesting we stay in them. This is due to the fact, that at all hours of the week of the DNC delegates may be needed for critical votes. THIS IS HOW WE WILL FIGHT FOR BERNIE! So we need to be there and ready to help ASAP! I expect food to be expensive at the convention center. I've been told to plan on this week in Philly for the DNC to cost will between $3,000 - 5,000. My latest estimite: Airfare: $550 + Hotel: $1,500 + Food: $250 = $2,300. To save some money, I will be splitting a hotel room with two others, we have two queen and one pull-out bed. Hotel and airfare have now been booked. If I have any extra money after the DNC it will all goto Bernie or progressive candidates, if he is not the nominee. I will also use excess funds, over $2,500 to help other CO Bernie delegates fund their trip if needed. Just a two days until I leave for Philly! Fly out Sunday and get back Friday. Very excited to see Bernie and many others who have made this movement possible! Hotels are now booked! I will be splitting a room, with two queens and a pull-out bed, two other CO Bernie delegates. My part of the hotel cost will be about $1,200. We are staying in a cheaper hotel Sunday night, then move into the offical DNC hotel for CO Delegates Mon-Fri.
A few people have asked about group funding and how the delegate process works in CO.
We are looking at doing group funding, I also helped created this doc with all 45 CO Bernie DelegatesAlts in it and funding URLs for those that have one: http://v.ht/CO4B. The FEC rules to do group funding requires several things and take time to get setup. We are working on this too. To become a CO Delegate you must be voted to be a precinct level delegate. That vote happened for me on 3/1. This then makes you a county delegate, I was one for Boulder County. At the Boulder County convention I also won the vote to become, one of ~200, a CD (Congressional District) and State Delegate. My CD4 convention was on 4/16 and I won one of three national spots there. The next day was the State convention, where those who didn't win in their CD could get an "At Large" spot. So it goes Precinct delegate -> County -> CD & State -> National Delegate. You had to campaign a lot at the CD and State convention to get a National spot. 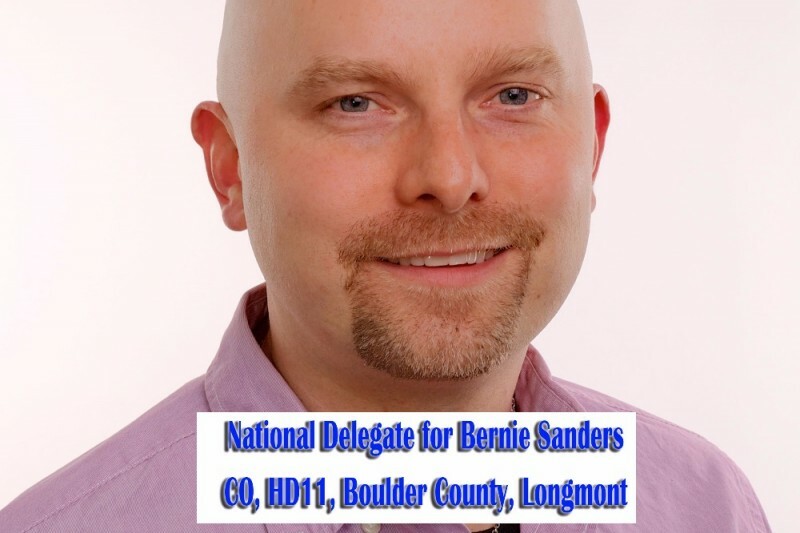 Many people knew my name since I helped organize volunteers in Boulder County and educate many of the delegates. Hello supporters! I had an issue with my GoFundMe account that prevented it from taking donations for the last several days :( It's fixed now. So if you tried to donate more recently and it failed, please try again. Cost of my airfare is now covered. Thank You!!! Next goal is to get my hotel cost of ~$3,125 covered. I will be splitting my hotel room with another Bernie delegate. So my part is $1,562 but if I can get the full amount covered here then I will pay the entire amount. Have a great time! Wish I could give more. If I was Goldman Sachs you would be getting more, but alas I'm just a poor working stiff.